So the last print edition of the Spanish architecture journal 2G (would it be more precise to call it a Catalan journal in Spanish and English?) 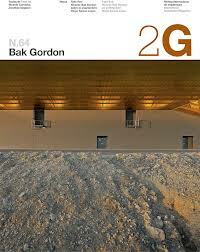 was issue #64 on Portuguese architect Ricardo Bak Gordon. From when 2G first appeared in 1997, its issue featuring David Chipperfield, it was clear that the magazine possessed an excellence that was immediate. The graphic design dispensed with the frenetic image cataloging of architectural publishing that copied Mau and Koolhass’ SMLXL and instead reached back to claim something like the calm modernist authority of Massimo Vignelli’s design for the Japanese journal A+U. The structure of the magazine, with minimal advertising, beautiful photography and drawings, along with collected essays from the featured architects and top academic or critical commentators, took it out of the temporal realm of the design journal and imbued it with the character of a standalone monograph. In the intervening 16 years the editors managed to steer a path distinct from that of their competitors, featuring contemporary and classic modern work that in many cases was “untimely” in its disregard for the line of formal investigation expected from architecture in the first decade of the 21st century. There are several stand-out issues: #9 on Williams Tsien is better than any other publication I’ve seen of their work, # 12 on Craig Elwood is an excellent introduction to his work and an amazing companion piece to the wealth of publications on the Case Study House project, and I can’t imagine another magazine taking on the architecture of Max Bill as comprehensively as 2G did in #29/30, to name just three. It’s worth pointing out that the presentation of both English and Spanish, alongside each other, differentiated by the blue colour of the English font remains, for me, the most elegant example of bilingual publication I have experienced – both are distinct, neither is privileged. The thoughtful attention to detail that gesture represents is part of what set 2G apart. It would probably be too much to hope that the demise of the print edition is not related to the collapse of Spain’s economy in the wake of the derivative depression that has gripped Europe. I hope that the step into digital is being taken with the same spirit that launched the magazine in 1997, but I fear it’s a defensive play. It is expensive to create quality publications and few of us now seem prepared (or perhaps able) to pay. I will be trying the digital 2G in hopes that it is more than just a PDF. If time permits I will post some thoughts on it in future. Welcome to The Cat’s Laugh. This blog is named after a phrase in Hannes Meyer’s 1928 text “building”. Meyer wrote: “all life is function and therefore not artistic. the idea of the ‘composition of a dock’ is enough to make a cat laugh!”. Meyer was the second director of the Bauhaus at Dessau from 1928-30. I always thought the phrase was funny and Meyer is such a fascinating figure, his legacy at the Bauhaus relatively unknown by the general public. There may be some future post on Hannes Meyer, but the blog is really intended as a way to share images and ideas about architecture and design. I hope you enjoy it!